We used a ceiling canopy of fairy lights suspended from the beams to add sparkle and light, then hung coloured paper lanterns randomly on the fairy lights. 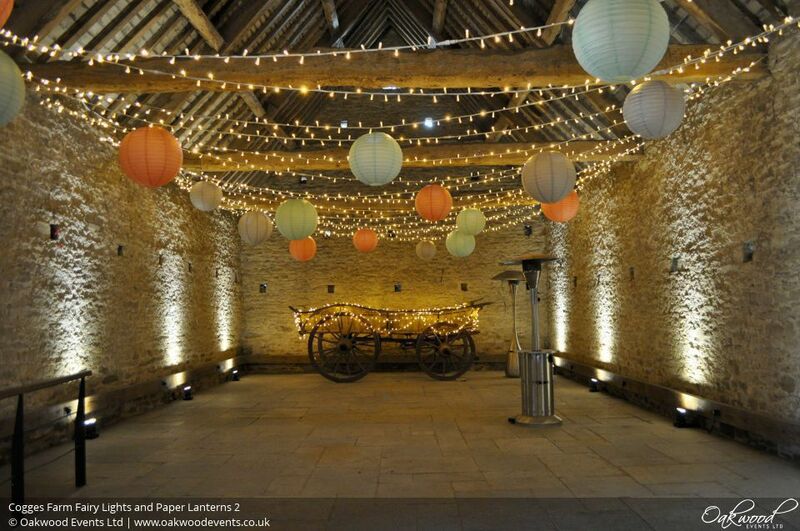 Around the walls of the barn we used LED uplighters with a wireless controller so they could be set to warm white during the day and then change colours in the evening. A few more sparkly fairy lights added to the lovely carts at both ends of the barn completed the look! Just wanted to say a massive thank you for all your help sorting the lighting/lanterns for our wedding, and also to Steve for his help setting up and showing us how it all works the day before. The barn looked fantastic on the day - even better than we expected - and you guys made it all so easy. 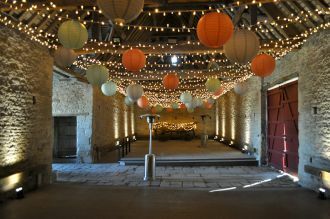 So many of our guests commented on how spectacular the barn looked. We have a dedicated page for Cogges Farm lighting here. You can get in touch with us here to discuss lighting ideas for your wedding in this fabulous venue. I just wanted to email you to thank you and the team at Oakwood for the beautiful lighting, lanterns & up-lighting you supplied for our wedding. When I stepped into the barn for a sneak peek before the guests entered it was so breathtakingly amazing that I cried! The lighting got even more beautiful as the night went on and we lost the natural light, it was fantastic! You have been an absolute pleasure to work with and have been extremely professional in ensuring that everything was perfect for our special day so thank you very very much!